Do the Amish care about the environment? How do they respond to challenges like pollution, the impact of pesticides, and habitat loss? College of Wooster professors David McConnell and Lyn Loveless wrote about Amish views of nature in their last post. They return today with a look at the Amish and environmental problems in their communities and beyond. Do these issues concern Amish people? Is the Amish lifestyle “ecological” as some outsiders believe? As they write at the end, your thoughts and contributions are welcome as they explore this interesting topic for their upcoming book. Recently, we’ve been thinking about attitudes within Amish communities to local and regional environmental issues. 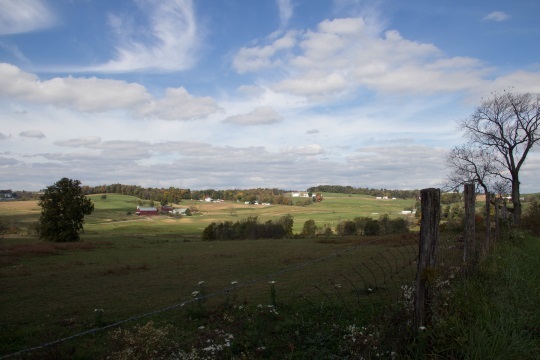 Amish farms and communities are part of a larger landscape and are embedded within a political system that must confront a variety of environmental challenges. These include water and air pollution, pesticide use, over-development, land use and zoning, and habitat loss and degradation. Local, state, and federal regulations have been created to address many of these shared problems. We are curious about how the Amish respond to these challenges and whether and how the Amish embrace the idea of ecological limits to human activities. Skepticism & An Ecological Illusion? One the one hand, many Amish with whom we’ve spoken associate environmentalism with liberalism and tend to downplay the seriousness of regional and global environmental problems. Like some non-Amish, they are nonplussed by the environmental agendas espoused by the state and federal government and feel frustrated when outsiders who appear to have little practical knowledge seemingly meddle in their affairs. The Amish tendency to refrain from certain types of civic participation and activism also limits their ability to confront larger ecological challenges that cross property lines and state and national borders. In addition, the Amish suspicion of scientific evidence and their reluctance to base decisions on information beyond their own experiences may lead to a reactive, not proactive, stance. While most Amish will comply with environmental regulations, they may see them as a nuisance and a constraint on their activities, and not as appropriate restrictions on behavior that contributes to the common good. One middle-aged man from the Andy Weaver affiliation expressed this perspective to us quite clearly: He told us that he can’t EVER remember being taught by his parents about the ecological value of nature. He gave the example of the trees on his property. He takes good care of them because they are useful to him as firewood and possibly to sell for timber, not because taking care of them is ecological. He concluded by asserting that any Amish behavior that looks ecological to outsiders is really just a by-product of religious values that emphasize thriftiness, simplicity and responsible use of God-given resources. And yet on the other hand, we’ve come across some interesting examples of Amish who are actively involved in protecting natural landscapes or who are changing their farming practices to address water pollution. In several settlements, for example, Amish individuals have served on the boards of Rails to Trails programs that convert old railroad lines into bike, buggy and walking paths. And in some instances, they actively protect natural habitats. We know of at least one example of an Amish man buying a prime area of wetlands to preserve for shorebird migration, while another individual had planted native prairie grasses on his property, in part to educate future generations. In the Lancaster settlement, Amish farmers have generally been very cooperative with programs sponsored by the Environmental Protection Agency to address the dead zones in Chesapeake Bay caused in part by nitrates and phosphates in farm runoff. And we’ve learned about Amish participation in some recycling programs (both for household waste and for plastics used in farming), though it’s not clear how widespread these are. Nevertheless, these examples suggest that some Amish do not assume Creation will stand up to any possible consequences of human behavior, but instead recognize ecological limits to our actions. Do you know of local or regional environmental issues or challenges in which the Amish are involved? If so, how do they explain their interest in addressing these issues? Do they find the ecological rationale compelling? Or do they focus on other benefits that will come from such behaviors? Do they acknowledge the need to reduce their impact on natural systems, or do they generally doubt that their actions could have long-term negative consequences on others? Since we’re limited in our ability to travel, we’d appreciate hearing (either in this forum or, if you prefer, off-line at dmcconnell@wooster.edu or mloveless@wooster.edu) about any examples from Amish settlements across North America with which readers are familiar. 45 responses to Are the Amish Environmentally Minded? It seems to me, that by living without modern modes of transportation, electricity, computers, televisions, etc., they are being environmentally friendly. Their horses do emit waste products (lol), but even that can be re-used if one wants to grab a shovel and have at it! I’m thrilled that my College of Wooster colleagues Dave McConnell and Lyn Loveless are pursuing this topic. From their blog, it seems to me that it’s about technology and values, not just ecological-mindedness. In his book, “Enough: Staying Human in an Engineered Age,” environmentalist Bill McKibben uses the Amish as an example of what’s needed for humanity to become environmentally-responsible: careful, thoughtful, community-based decisions about which technologies are destructive of our common values, and which are not. For McKibben, it’s not an issue of whether the Amish (or Native Americans or any other group) respond to the world the way a member of the Sierra Club would, but whether they hesitate to embrace the next technology that comes along, regardless of its consequences. Amish values are Bible-based, but it isn’t necessary for our big, diverse society to follow or interpret the Bible the way the Amish do. It is important for all of us to make decisions about which technologies we’re going to embrace, based on something greater than profit, novelty, or convenience. Some technological changes have had positive ecological consequences, but many others have simply extended our capacity to mindlessly foul our own nest. What the Amish have to teach the rest of us is that we have technological choices to make, and we should make them based on our values. Well said Damon. My generation started out to simplify and protect the land, however somehow most of us were tempted back to convenience and technology. Oh, don’t forget moneyy and lots of it. Well, I don’t suppose there is a carbon “hoof print” in the sense that our society talks about a carbon “footprint” and perhaps that is why they see this as less of an issue. The fact that they use horses or scooters or bikes to get around says so much about their lifestyle. If we all did so … though of course that would be odd in the middle of downtown Austin, TX. I love your comment above about “responsible use of God-given resources.” I’ve certainly seen that in communities in Indiana, Ohio, PA, Wisconsin and Oklahoma. Thanks for the post! Convenience and technology seems to draw us away from the land and environmental friendliness. I challenge other Christians to really pray about whether this is godly. God created the heavens and the earth. He made it a certain way. And yet we mess with it. We eat synthetic food. We wear synthetic clothing. We spray crops with harmful chemicals. This messes with the health of the body, which is supposed to be the temple of the Lord. It also hurts wildlife, which God created. What will we do when the bee population is so decimated that crops, trees, and plants aren’t pollinated? To truly live a godly lifestyle, to live biblically, to live plainly, I believe we must live according to the Bible. We must be stewards of the earth and animals, as God created us to be. Factory farming, slaughterhouses, pollution, even just the trash from our homes … all of this is completely unbiblical. And we wonder why we are all so sick and blame God for cancer and other diseases. I think what truly breaks my heart is to see liberals caring about the Earth God gave us while Christians talk about liberal “agendas”, as though we shouldn’t care about the Earth God gave us to protect. What does that really say? Damon & Amy, well said. It’s probably time for us all to re-evaluate our personal responsibilities in respect to the earth, which includes the physical earth itself and people, who often seem to ignore it all too often, to our own detriment. I do profess to be “Christian,” too, although I am also aware that I myself often fall short. Revelation 11:18 states, “18 But the nations became wrathful, and your own wrath came, and the appointed time came for the dead to be judged and to reward your slaves the prophets and the holy ones and those fearing your name, the small and the great, and to bring to ruin those ruining the earth.” Just something to ponder on. IMHO. I’ve been around long enough to see what IMO appears to have been the pendulum swing from one extreme to the other. The fear-for-mother-earth drive of the 60’s and 70’s (who can forget the Indian-with-a-tear-in-his-eye commercial against pollution?) gain enough momentum to (again, IMO) swing it past center, and without a proper counter-balancing force has swung to a similar extreme in the opposite direction. Do I see the Amish involved in such ecology-conscious movement? In my admittedly limited interpersonal interaction with them related to this, no, I don’t. But whether by the simple nature of their simple living, or by the balanced approach of being good stewards of this world God has given, I do see their lives being quite earth-friendly, at least from a practical standpoint. With no intended disrespect towards anyone, I must admit that the irony of this whole thing does not escape me. For all the gas burned in the (presumed) trips while meeting with the Amish discussing these matters; the electricity, paper, etc. used to tabulate, analyze, report and distribute the data and findings of the research; and don’t forget the environmental impact of making the cars and computers used in doing the research and the electricity for the lights even in the office while doing it all…. All of this by the environmentally sensitive in order to put under the microscope those who by-in-large don’t share the sense of ecological distress…. And the irony is that it is those with the proactive ecology agenda that are themselves making the bigger negative impact, even in doing the research itself. BTW, love the “carbon hoofprint” express, too. Good job, Vannetta! The irony does not escape us either, Don, and it’s helpful to be reminded of it. There is no question that the process of doing our study has its own ecological impact in all the ways you point out. On the other hand, any human endeavor will consume resources at some level. Asking questions and looking for patterns in the world is central to the human condition and to academic inquiry. Whether the outcome of that effort is worth its ecological cost is always a value judgment, one that is sometimes hard to discern. Thanks for your observations. In response to one question your article asks, “how do they (the Amish) respond to pollution?” I encourage you to read the following article….. www.shalereporter.com/…/article_fe275884-364c-11e2-87be-001a4bcf687….. This article helps explain how seriously the Amish take their role of “stewards of the land” as well as, shows how they TRULY care for their non-amish neighbors! Sorry, Fran, I can’t seem to access the article. Have they removed it? Fran, not ALL Amish are alike. I appreciate my neighbors, Amish & English, and know that lumping all of any group together is narrow-minded. I have some neighbors (Amish & English) who are wonderful “stewards of the land” and some who could do better. Your attitude comes across as very bigoted. Now, if you’ll excuse me, I’m going to enjoy the fresh strawberries & cake that my kind and dear Amish neighbor lady sent over. I like knowing her berries are produced on a carefully tended piece of land that has been in her family for generations and that they are healthy and chemical-free. Though I don’t do much gardening, I’m often the recipient of garden-goodies from my Amish neighbors. I firmly believe that to have good neighbors one must BE a good neighbor. That’s what I like about my neighborhood: we all try to get along and respect one another. Are the Amish Environmentallly Minded? That term is not only inaccurate but, can show the narrow mindedness of the user. It can also be offensive to some people as well. Also, I do not appreciate being called a bigot, simply for suggesting a reading that simply portrays one point of view of the Amish – an article that suggests there may well be a variety of opinions! So, respectfully Kate, I hope you do enjoy your cake and strawberries! The fact your comment said: This article helps explain how seriously the Amish take their role of “stewards of the land” as well as, shows how they TRULY care for their non-amish neighbors! makes it sound like “all Amish” are being classed as one homogeneous group. I did not feel it was bigoted to suggest reading an article, but for implying “the Amish” (as opposed to “some Amish) do not care at all for their neighbors. Perhaps I am guilty of rushing to judge and reflecting on past comments and I will apologize for implying your comments are bigoted. I am sorry. Amish & English? In our area it is used by everyone but I remember Mark from Holmes Co. saying in his community they are more apt to say non-Amish. Again, I apologize for not being more sensitive. Do you ever interact with your Amish neighbors? None of my business, of course, but I wondered. relatives or friends who lived in cities would come to visit during the summer, we’d load them up with fresh produce to take home. One day, one of them asked if we were grew “organically”. We had no idea what they were talking about. We just never used chemicals on our garden because we were thrifty and took the time to do hand-weeding and hoeing rather than spraying weed killers around the plants. I’d say just our way of life is fairly environmentally friendly. Of course you’ve got both kinds as in any culture. There may be an organic farmer and one who uses chemicals in the same neighborhood. Of course we use compost and manure on the fields and gardens. At home we catch rain water for watering and also use our laundry rinse water, which is safe for the garden since we use natural laundry soap. As with many other aspects of Amish life you’ll find diversity. Not the Amish around me! I am happy to hear that many Amish seem to take stewardship of the land seriously. The Amish near me do farm with the usual Amish practices, but that is where it ends. They burn plastic and tires and seem to be careless with chemicals. And many Amish near Shipshewana likewise burn plastics and tires regularly. They also burn when there are fire hazard warnings. Sorry-I shouldn’t have gotten started, but those things really bother me. As an Amish person who does not burn plastic or tires (and wonders “Tires? Where are they getting tires & why? And why are they burning them once they have them?”) who recycles plastics, glass, & newspapers, uses only limited chemicals (Round-Up on our gravel driveway, rose spray, etc.) I would be annoyed with a neighbor doing that too. Are the Amish “above the law”? Not in my opinion! Now I could take the fact one of our non-Amish neighbors uses a LOT of chemicals and has been known to be careless burning things and tosses everything he can’t burn into the trash rather than recycle as proof that Italian-American Catholics are environmentally irresponsible but reason tells me that though some have shown themselves to be careless, there are likely many others who are not. Do the Amish do anything wrong? Absolutely! I can think of cases where Amish people have been guilty of horrible things like abuse, drugs, alcoholism, breaking the law, being disrespectful or rude, and the list could go on and on right up to suicide or murder. The Amish are human and subject to temptations, sin, bad-choices and poor judgment, being a bad neighbor, lapses in good citizenship or Christian living just like some other humans in America today. And like other people, most of us fall somewhere between saints or sinners and are trying to live a decent life with our Christian beliefs and values as our guidelines. I was always taught that judging others by the actions of a few is not wise or fair. I believe that and would hope others could see that we are not just one big group of people that are all the same. Not only is there a big variety from community to community or group to group, but within each group there are differences in individual personality, individual behavior and individual strengths and weaknesses. Mark, I am glad you and many of your community observe good practices. And I did not mean to imply that the English I know are any better at it. I know too many farmers that overfertilize, and their herbicide wiped out some of my treasured bushes when their equipment malfunctioned. My nearby Amish have fairly good farming practices, although those could improve to control erosion without compromising their natural style. I am quite concerned about the burning, however. And we do have free recycling of plastics at the town where our Amish do most of their business. My local Amish do not have tires often, just on something they convert for their use. The Shipshe (Lagrange Co.)Amish have tires on everything. And I it seems that very few English near me burn such things–more fear of the law there. And I have had Amish tell me that the English law doesn’t apply to them! Obviously and thankfully this is a very small minority of the Amish. I have some very dear friends among the Amish that I respect highly most. But Amish are just like the rest of us. Some are great, some are rascals. And “English” is what they call us. I am not offended. It is certainly easier to say than non-Amish. But then, my ancestry is English, so that helps. I feel for you, Cora Vee. We had “spray drift” wipe out some ornamental shrubs, too, and I was very disappointed. Thankfully our neighbor noticed and offered to replace them, which we would not have asked for but appreciated. We see a lot of Amish in our area recycling, but I really can’t explain why. Personally I like to be able to do it and secondly because we pay for trash, recycling keeps our trash removal fee down somewhat. I use non-Amish, like most people I know. Partly because calling, let’s say a person from Japan “English” seems weird. 🙂 For a lot of Amish they’ll call us “Deutcshe” or German because that’s what we speak and call non-Amish “English” because that is what they speak. It was never intended to mean people from England. Thank you for your opinion Mark. I will respond to you first question as to where the Amish are getting tires, by saying I do not where they get them but, where I live they use them on their face lines for stability for there is not a lot of top soil in our area. Secondly, I understand where, not only you are coming from but, what a number of posters on this forum mean when they say “the entire group should not be judged for the actions of a few.” In my defense, it is hard to do so, when you have 4 amish farms within .75 (yes, I measured the distance) of your home and you see the same type of behavior happening on all 4 of the farms day after day, year after year. Like I stated in a previous post when the Amish were leaving Fam equipment on the shoulder of the road and I was told by the NYS police that they weren’t going to do anything about because, “the Amish get away with more than the average citizen.” One can’ help but be left with negative feelings about an entire group! To the people who choose to respond to the way I feel and or view my not so friendly neighbors I offer no apologies! Sorry that should read “fence lines”. Thanks for the answer, Fran. I’m still not 100% sure how the tires are used, but I’m getting an idea they are put around the fence post to stabilize it. Am I right? I’m assuming your neighbors are Swartzentruber Amish based on your comments earlier on the SMV triangles. Though all of your neighbors might be Swartzentrubers, over-all they are a minority compared to other Amish. Though I don’t know a lot of those people, I know some and I know their way of looking at the world is somewhat different from what we are used to. They have points I respect — one being they often do better than our people in taking time off for each other. Not being so tied down to a job, they are better able to drop everything and welcome a visitor, take time away from their own work to help with a death, sickness, or work project. On the other hand, they do tend to see the people around them (Amish or not) in a different way. I’d see them as less in-tune with everyone else, if that makes any sense. I’m not excusing it, but that is how I see it. I’m not saying I approve of it, either. If I had neighbors burning tires, I’d be very unhappy about it too, no matter who or what they are. If I may make a suggestion: referring to your frustrations it might help to write “the Amish in my neighborhood” or “my Amish neighbors.” And I say that humbly, not trying to slam you. Those who read it might then realize you are talking about a certain location or particular families, not the larger Amish society. Again, I totally understand how frustrated you must feel — I think any of us reading this page might feel frustrated by neighbors who are not being good neighbors! Personally, I’d probably try & talk to them and point out that tire/ plastic burning is illegal or harmful and I wanted to talk with them personally as a neighbor rather than have them run into trouble with the authorities. There is no guarantee it will work, but it’s a starting point. I know some things we can’t “fix,” like the smell of a manure spread on a field, but it seems to me a pile of burning rubber is a whole different matter. @Fran, have you tried talking to your Amish neighbors and tell them how you feel and why? Perhaps if you had a face to face, they would be open to changing how they are doing things if they can be convinced it is not God’s design. Do they know you are bothered by it? Fran, so you are basing your comments on what you see in 4 Amish farmers, when there are a total of almost 300,000 Amish in the US scattered in about 480 settlements, so my point is 4 is a very small sum of Amish farmers and even if that whole community operates that way, that is still a small minority. And I don’t understand why a policeman would make such a comment. It definitely would not be the norm here to expect special treatment because of our religious affiliation. Really Amish who operate like this typically frustrate the rest of us , too. I’ve been taught to follow the law, as long as it does not go against the Bible and so far I have been able to follow the law and the Lord’s word. I’m not asking you to apologize for your comments about your neighbors, just to try to understand we are not all the same. There is a wide diversity among us. In my experiences I haven’t “seen” the Amish in anyway be intentionally environmentally friendly. They do by way of their traditions and culture tend to be more natural and frugal, helping the environment in that sense. Meaning they reuse so much therefore making less waste, no electric, vehicles, etc. However in our community, they are now aloud motor power lawn mowers (not self propeld) and weed eaters and believe they can also use gas power air compressors. In addition to propane stoves that just has been ok’d. So the short of it in my experiences I had to say no. As to the women who had an issue with the term the Amish use for us non Amish I had to laugh. Not at you, but my SIL who is Amish asked this question of me not to long ago! I told her that it doesn’t necessarily offend me but that I was Italian and German! I guess if I referred to the Amish as the Germans or Sweds how would she feel? She answered with a smile. So there’s your answer which isn’t an answer at all. Look at it this way… Just last year it was a sin (a big one)to use gas power lawn mowers and this year it’s fine! Who knows why? They don’t even know why. You don’t ask why, it just is. Beckysue, did the Amish actually tell you using a power mower was a sin or is that your way of putting it ? Here we would just say it’s not allowed by church standards, not that it’s actually a sin. Even our leaders would not say it’s a sin. We have many rules that are considered guidelines not sins. We believe it is important to have standards and follow them. There are many things that I don’t have personal convictions against,but I do have convictions against disobedience. If I promised to obey and follow this church when I was baptized, knowing all the rules I feel I should follow the rules to the best of my ability, even if I don’t understand everything. A sin to use a power-mower? I agree with Rebecca’s comments on this. There is a huge difference in overstepping the agreed-upon standards of one’s church or community and sin. I like how you succinctly put that Mark–that there is a difference between sin, which is universal, and going against standards which vary from church to church. Thank you all for your comments. yes, I have tried talking to my Swartzentruber neighbors about their behavior only to have it fall on deaf ears! Which makes my living situation and opinion rather bias, I will admit. I also will admit my comments on this forum have been rather harsh in the past and I only ask that now, with a little deeper understanding, regular posters may understand point of view. Yes, I understand, Fran. Anyone putting up with bad neighbors is in a tough spot no matter who or what the neighbors are. Amy, you have my sympathy, too. These comments make me more grateful than ever that we have great neighbors who are Amish and non-Amish! This is just off the top of my head, but what about putting it in writing and politely informing them you are asking them to stop. If it is illegal, and I assume it is, you might mention that, too. Keep a copy and if it does not change or improve you might forward the letter to whoever oversees that kind of thing. Just a suggestion… You’ll gain ground if you write it in a respectful manner for two reasons — one: people of any kind respond better and two: if you do need to share a copy with an authority it will sound more professional. That’s just my two-cents for what it’s worth. Another option is to write the same letter to a local bishop. (And I can find addresses for you if it helps.) I would hope a concerned bishop would be concerned about one of his members (or several) causing offense with something like this. Or our ministers would be, anyhow. We are frequently admonished to be respectful of our fellow-man and there is no mention made of that fellow-man being of any particular group. Again… I feel for you being in this situation! It gives me no amount of frustration. I’m sorry you are in that situation. Rebecca, thinking back sin wasn’t my best choice of words, however if its in the ” church rules” it would be considered going against the church which is sinful. So maybe we’ll just leave it at that. No in fact when I drove up to my sister in laws place, she was using a weed eater. I laughed and she said…”what?? Its legal!”. I had not known it was something new. So again the use of the power mower wasn’t the sin itself , going against the rules of the church by using the power mower would be. Hope that better explains what I was trying to say. Beckysue that sounds more like it. In our community we have many different sects or orders or whatever you want to call it, so I use a power mower and think nothing of it . My neighbor uses a push mower, but that does in no way affect our relationship. It is what it is. But when they borrow our things like a power drill, which their church doesn’t allow, then not take good care of it – now that can be frustrating. But in order to be good neighbors I guess we do need forbearance. I think every people group has this kind of people. I’m glad I was able to explain it a little better. I agree that the diversity between communities, even within a short distant can be a contrast. Which I find quite interesting. I’ve also heard of communities being split over things they couldn’t quite agree on. When I hear someone say that the Amish are “simple” I have to disagree. I think the simplicity of lifestyle (clothing,houses,ect) May be simplistic however there are quite few “rules” (for lack of a better word) that need to followed. For instance the hem on dress or the pleats on a cap is something I’ve learned can help decipher between communities. Well said, Beckysue! This way of life is not as simple as some seem to think it is. So, Rebecca, if you lend the power drill, which you know their church doesn’t allow, are you sort of “contributing to their delinquency”? Good point, Carol, but how do you tactfully tell someone “No, you can’t use my power drill (or whatever it may be), because YOUR church does not allow it.” I guess my personal opinion on that is : He knows his church rules, he’s an adult, so I don’t really feel it’s enabling him, because in all reality his church leaders probably don’t really even care if he borrows it, just he shouldn’t own it. But please don’t ask me to explain that reasoning, because I myself don’t understand. Maybe it would be a little like me hiring someone to take me somewhere in their car, even if I don’t have one myself. The frustration is not in the borrowing as much, as in not taking care of what you borrowed. I have always been taught to loan a neighbor what he asks for if possible in order to be neighborly. As an interesting side note, let me give you a list of things we neighbors (others besides the drill borrower) have loaned back and forth :ladder, mower, tiller, pony cart, buggy, horse, Lifetime tables, grape juice steamer, Ship Ahoy game, volleyball net, a stick of butter (and many other grocery items), 5 gal. water jug, 10 gal. coffee butler, manure spreader, wobble light,chop saw, log splitter, chain saw, bicycle, spring water (Yes, for almost a year we hauled all our drinking water from the neighbors spring, because ours went bad), and there’s probably more which I can’t think of right now. Hope you all enjoy that. Carol..I have a funny story about my BIL borrowing a mower he wasn’t technically suppose use on his own lawn that I think you might get a chuckle out of! It was their turn to host church and with being behind on getting things all ready he went to the neighbor who owned a walk behind. He used the mower to get things in order outside quickly done and then stored it in a shed in the back pasture where no one would see when they came. Well not long after we had a doosey of a storm with wind, lighting and rain like no other!! During that storm a tree was struck by LIGHTENING and fell on the shed which stored the neighbors mower completely demolishing the shed along with most everything inside. He ended up having to purchase a new one for them. I still laugh when I think of the chances of that happening! 1) It’s a trait of the German-settled communities from the Mid-Atlantic westward to have great concern for their local community and heritage — but wanting to both be left alone and to leave others alone. The Amish may be one of the more extreme cases as they were one of the most persecuted communities; but all the German communities having come from an area of many competing princes and frequent wars just don’t have as much of a concern over “national” affairs. 2) I don’t know how close to Alpine areas the ancestors of the Amish came from, but the Alpine farms are one of the few examples in global history of successful, long term mountain agriculture. Folks who had the wisdom, patience, and persistence to every year take the soil that had taken decades to wash down to the bottom of the mountain and haul it back up by rope and bucket to the top of the meadows and put it back to begin it’s journey anew. Most steep places on earth that humans farmed, within a few centuries all the soil was depleted. wow if this is the question of the year….do the bears relieve themselves in the woods?? the Amish are more enviromentally minded than those in charge of the EPA. this has got to be the most stupid yet hilarious question i have heard in quite awhile. I think in the near future it will many of us seeking the Amish on how to store food with out a fridge, how to be self sufficient and live as simply as possible. Leave a reply to Are the Amish Environmentally Minded?